I am pleased to announce that vSphere PowerCLI 5.5 R2 has now been released and has some great new features. In this release we take PowerCLI one step further and allow even more troubleshooting, reporting and automation of vCloud Suite products by introducing easy access to vCenter Site Recovery Manager (SRM) APIs through the core PowerCLI cmdlets. Why wait, download the latest version today from here. vSphere PowerCLI 5.5 Release 2 introduces the following new features and improvements, for a full list of all that has changed please check the full vSphere PowerCLI 5.5 R2 Release notes here. all public APIs available, use of the $global:DefaultSrmServers object properties and methods after connection allow for access to recovery group and protection group automation, see the built in help and examples for more information and watch out for future posts with more information on this site. Enhancing the cmdlets from the previous version of PowerCLI we are now able to use PowerCLI for complete Tag management with the added New/Set/Remove Tag and TagCategory cmdlets. Adjustments to the Host and Cluster Cmdlets now allow for enabling, disabling and retrieving information for EVC Mode making automated build environments one step easier to accomplish. Security policies can now be easily adjusted on vSphere standard switches and portgoups using the Get/Set-SecurityPolicy cmdelts. PowerCLI has been updated and we have added the ability to specify all supported types including clusters, datastores, etc and retrieve more statistical information via the Get-Stat and Get-StatType cmdlets. The above list is a high level list of the updates made to vSphere PowerCLI, for a more comprehensive list including all parameter and functional improvements, security enhancements, and deprecated features, see the vSphere PowerCLI Release Notes and the vSphere PowerCLI Change Log. 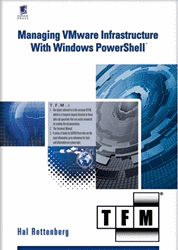 This entry was posted in Advanced, Tags and tagged PowerCLI, PowerShell, VMware on March 12, 2014 by Alan Renouf. The Tagging feature was introduced in vCenter Server 5.1 where custom defined tags can be categorized and added to any of your inventory objects in your environment. Tags can be quickly searched on and retrieved quickly. Multiple unique tags can be used on the same inventory object creating granular metadata that can easily be grouped and search on. As an example this is helpful for looking for all VMs tagged against a particular project or placing all departmental objects into groups, IE HR requiring not just there VMs but networking and datastores used as well, This all benefits the administrator by simplifying management and making information more easily available. This entry was posted in Reporting, Tags and tagged PowerCLI, VMware on December 3, 2013 by Alan Renouf.